Object of target class created (or updated) and this object matched to the queue criteria. The next step is recalculation of the “SLA Group: %ИМЯ_SLO%” group. Because the object already contained in given queue and created time of the SLO is early than created time of our object the object will be added to “SLA Group: %SLO_NAME%” group and event AddRelationhsip will fired. The “SLO_NAME%-AddRelationship” workflow’s source module catch this event and run workflow. The process of deletion from queue and group is the same instead of event will be DeleteRelationship. Note: The SCSM engine can handle several types of SLA management but the SCSM 2012 (and SP1) support only one – date-time property based. So the first step for all workflow described below must be “Check the type of SLA management” but I will skip them because in all cases it will be the only one type. Get the System.SLA.Configuration object by id (“SLAConfigObjectId” property) and get the settings of this SLO (target and warning threshold) and related calendar and metric. Calculate target time based on metric and calendar. Created at step 3 object added as relationship to the object what has been added to group (i.e. to WorkItem). IsCancelled True if SLA was canceled. False by default. $IR = Get-SCSMObject -Class (Get-SCSMClass -Name "System.WorkItem.Incident$") -Filter "Name = 'IR8579'"
$rel = Get-SCSMRelationshipClass -Name "System.WorkItemHasSLAInstanceInformation$"
Note: The status of the “Service Level Instance Time Information” object can be different from Active. See the “SLA tracking” section below. The reasonable question is “What happened if we removed object from queue and then added it back?”. In case of my demo configuration it means what we changed urgency to medium, save the incident, wait some time and change the urgency back to High. The answer is simple. The SLO%-AddRelationship workflow will start each time when object added to group. And this workflow knows what if “Service Level Instance Time Information” object for given SLO already existing he must change the IsCanceled property value to false and recalculate target time and status. and recalculate state for for each founded object. Now it’s time to talk about “Service Level Instance Time Information” object’s states. The SLA tracking system is not enough data for calculation. In generally this means what the property what set as Start Date in metric has null value (empty). And only when the First assigned value changed to some value the SLA will start tracking. This situation handled by %SLO_NAME%-StartEvent workflow (see the list of workflow in Part 1 and in the beginning of this article). This status means what SLA tracking system is live for this object: the object isn’t canceled, the Start Date is not null and End Date is null. This means what the “ServiceManager.SLAManagement.Library.SLAInstance.TimeInformation.PeriodicRule” workflow was found what the End Date property is still null and (TargetEndDate value of the given object minus “Warning threshold” value of related metric) is less than current time.To show this I changed the Target Time for metric to 1 hours and Warning threshold to 20 minutes. This means what the “ServiceManager.SLAManagement.Library.SLAInstance.TimeInformation.PeriodicRule” workflow was found what the End Date property is still null and TargetEndDate value of the given object is less than current time. This means what SLA tracking is paused. I wrote article about pausing SLA tracking long time ago. In part 3 of this series I will show how to configure this. But what if value for the End Date property will set before the Start Date property? In my example this is possible because the “First assignment date” set by workflow but the “First Response Date” can be set from console. So if the operator open the incident, assigned incident to himself and set the first response then the “First Response Date” will have a value but “First assignment date” will null until workflow fired. The good news what SLA tracking workflows can handle this situation and will will set “Met” as soon as Start Date property get some value. and “Service Level Instance Time Information” object’s status set to Met. Just the same behavior you can see if Start Date property and End Date property will be set in same time. 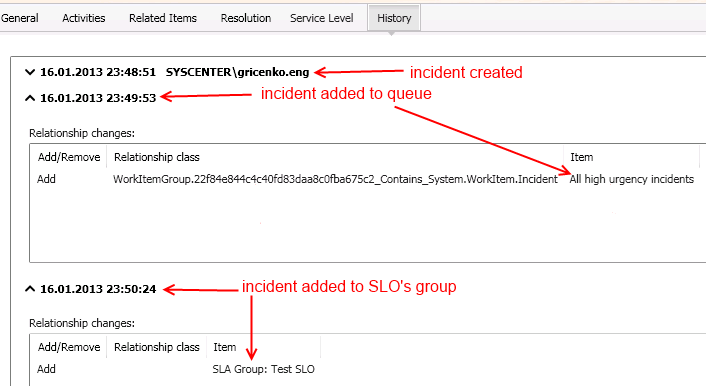 With standard workflow what handle normal SLA tracking there is one more service workflow are exists in SCSM. The internal name of this workflow is “ServiceManager.SLAManagement.Library.SLATimeMetric.Rule.Update” and it handle events of metric’s change. When started this workflow updates all criteria in all SLO’s workflows %SLO_NAME%-StartEvent” and “%SLO_NAME%-EndEvent” what have used a changed metric. That means what you can change metric’s properties and this changes will reflect to all object handled by SLO with this metric. But there is no other service workflows in SCSM 2012. As a result any changes made in SLO configuration will affected only newly created objects. Please don’t expect the “real time” reaction of the SLA tracking. As you can see the SLO configuration can be applying up to 3 minutes (one for queue calculation, one for SLO group calculation, one for workflow). 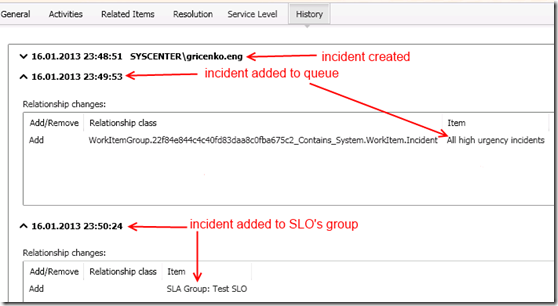 Same true for SLA tracking: SCSM will check object only once on 3 minutes. This question I saw many time. As you remember from Part 1 the newly created SLO objects affect only work items what was creaed after the SLO (a SLA Group: %SLO_NAME%” group and discovery). From this article you’ve learned what changin the SLO configuration also doesn’t affect the existing work items. But why so? To answer on this question we must move out from technical aspects and “read the papers”. The Service Level Agreement is the document. This document is very impotent because in most cases it used as “book of rules” between IT department and business. In case of Service Desk systems the Service Level Agreement tell as how fast we must react on requests from users. In some cases SLA can affect money. But in all cases the SLA is a law in all sense. This is rules of the game – game between IT and business. And also this is law document. And any law document can’t be changed by “post factum”. Assume what you take credit in bank for 2 years with 0,1% rate to buy a Ferrari. But after one year bank increase your rate up to 80% and ask you pay in additionally 79,9% for last year. But this is insane. The same for SLA. Any changes must affect only new objects. Previous post: SLA in SCSM 2012. Part 1. Object model.